From this country hotel the guest will enjoy marvellous views over the bay of Alcudia and it is situated in Can Picafort, the Northern part of the island Mallorca. The main building dates back to the 18th century and is surrounded by a beautiful park with a lovely garden full of palm trees, flowers, fruit trees, greenery as well as a wonderful outdoor terrace, bar and restaurant. All the 15 guest rooms of this country hotel are full-equipped and situated in the 3 annex buildings; surrounded by a romantic garden. Son Serra offers and organize horse riding, guided excursions to the mountains, katamaran tours, motor boat, water ski, table tennis, etc. Only 30 min. by car there are five golf courses. Massage on request. 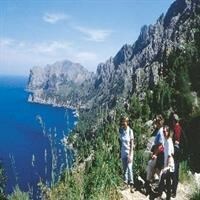 Mallorca is an island that boasts a wide array of incredible landscapes. This translates into itineraries in the mountains, along the coastline.